In 1891, Colonel Levi C Brinton, a Civil War Veteran, purchased a piece of land known as Big Run Falls for $5,000. In 1892, it opened as Brinton Park. Brinton cleared part of the land for dancing, picnics and by 1896, a steam driven, canvas top, Merry-Go-Round. Brinton wanted his park to become more popular and decided to build a streetcar line to connect downtown New Castle, to the park. However, he did not obtain permission from the New Castle Electric Street Railway Company, and was forced to remove the track at his expense. 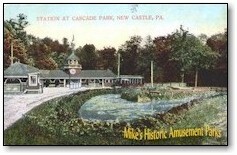 In 1897, the New Castle Traction Company purchased the 70+ acre park for $16,000. The park later grew to 183 acres. A landscape artist from Boston was hired to design flower beds, and a lake and dam. A contest was held to see who could come up with the best new name for the new park. A ten year old girl by the name of Edwina Norris won $10.00 for the name as we know it- "Cascade Park." Cascade, was then a "Trolley Park," and had 15 trolleys running to transport about 7,200 people an hour. Many other amusement parks at this time were known as "Trolley Parks." Some other Cascade contemporaries included Idora Park in Youngstown Ohio, West View Park and Kennywood Park in Pittsburgh. Kennywood is the only survivor. By 1900, Cascade's first Roller Coaster, the Toboggan was built and it was one of 17 rides the park had to offer. In 1922, the present Carousel building was built by the Philadelphia Toboggan Company to house PTC #64R. This Merry-Go-Round was originally located at Idora Park in Youngstown, Ohio. Some old timers can still remember trying to catch the brass ring to win a free ride. As for entertainment, the park offered bands in the Dance Pavilion which still stands, and bandstand. This huge, Victorian dance pavilion was once boasted as the largest in Pennsylvania. During the pavilion's golden days, performers such as Paul Whitman, Vaughn Monroe, and Danny Thomas performed there. The pavilion manager once suggested to an orchestra's piano player, that he would succeed in Hollywood. Henry Mancini, the musician did in fact, go to Hollywood. At the open air theater, just below the pavilion, park patrons could sit on the rocks for free, or pay 10 cents for a reserved seats. The theater, and the hillside was destroyed in the 1980's for the construction of a bumper boat ride which is now an abandoned eyesore. 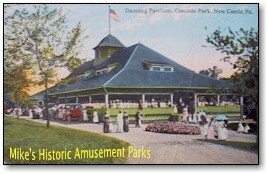 During the 1930's (the Big Band Era), dances in the pavilion helped the park survive hard times. Billy Glenn, most remembered for his popcorn wagon, leased part of the park and installed rides and other attractions. Where the pool is now, there was a zoo which Glenn removed to build the pool. The Gorge was the most famous rides Glenn installed. This coaster took advantage of Cascade Park's natural topography, just as the Comet later did. The New Castle Traction Company was later incorporated into Penn Power/Penn Ohio, and ran the park until 1934, when it was donated to the city of New Castle for $1.00. The only stipulation was that no alcoholic beverages could be sold at the park forever. After World War II, park attendance declined. People were becoming too sophisticated to spend a day at an amusement park. In 1940, New Castle did away with its trolley system and replaced it with the bus system. 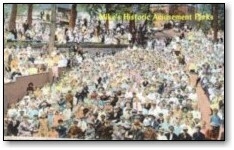 The park still had high attendance at this time, but not as high as its days as a Trolley Park. Large group picnics supported the park. The opening of Moraine State park hurt attendance in the later 1970s. By the 1950s, Paul Vesco moved in to manage the park. Vesco was responsible for adding the famous Comet coaster, which was sadly torn down in 1984. Other rides Vesco installed, included, new Auto Scooters, a used Tumble Bug, Ferris Wheel, Skee Ball concessions and more. He also replaced the old P.T.C. carousel with a newer version that used aluminum horses. During the parks last few years, Vesco kept the park going. Vandals contributed to the park's closing. One night they pushed one of the Comet trains out of the loading station. It then traveled to the bottom of the ravine. One night someone stole the Merry-Go-Round horses. To top everything off, a tree fell across the tracks of the Comet in 1982. Vesco and the City of New Castle had several mutual disagreements over rent and insurance. He was then told to have his rides removed by March 31, 1986, or they would be bulldozed. Sadly, all the rides and some buildings were removed. While amusements are now gone, the park has still survived. Local organizations donated countless hours to preserve what was left of Cascade Park. In the late 1970s, the 1896 dance pavilion was restored by the Paws 'n Taws dance group. The group added a new roof and refinished the floor. Later, the City covered part of it with linoleum tiles that read, "Cascade Park 1896." 1896 is the wrong year since the park opened in 1897. The old Carousel building was restored to its original condition in about 1987 or 1988. A local architect donated his services to the restoration. The windows and laminated beams were repaired, and a new floor was constructed with tongue and groove wood. The park is now home to "Back to the Fifties", which is a big event where hundreds of classic cars come from all over to to be a part of it. Other festivities include, Thunder in the Cascades, Italian Day, and Syrian picnic.